When the player with this weapon damages another player with an attack, they can discard an equipped horse of the target. The attacking player gets to choose which horse is discarded if the target has more than one. When the attack will causes damage, the attacker must then decide if they are going to remove a horse. They choose which one and discard it. Then the damage is given. Huang Zhong prefers this weapon over any others. With such a massive reach, His power will always be functional not matter what. This allows him to pile on the damage turn after turn. He better watch out and guard this weapon carefully though. No one wants to see that marriage turned against them. The Longbow is a useful weapon. It has a huge reach and a decent ability. What makes it great is that it doesn't cost anything to use the ability. The target is still damaged, and you get the bonus of throwing out their pesky horses. This helps bring them closer for all your friends to help pour it on as well. The downside is that you do have to hit the target to get do kill their horse. More than that, they have to have a horse for you to throw away. Even with this, it has a massive reach that allows you to reach across the table. Most useful when your target is on the other side of the game and you need to snipe them from afar. 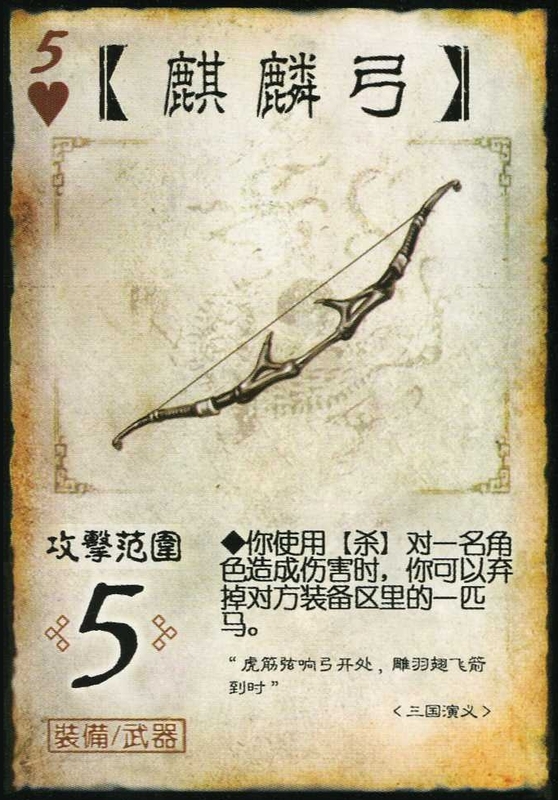 The Longbow was in fact use often by Huang Zhong in history. He was said to be a master archer, hitting one hundred out of one hundred shots at great distance. Despite his age, he was sent to duel Guan Yu during Liu Bei's siege of Changsha. After being spared by his opponent the day before, Huang Zhong could not deny returning the favor. When he was ordered to shoot Guan Yu during the duel, he pretended to shoot twice. Guan Yu dodged the 'shot', but, thinking that Huang Zhong could not hit him, charged forward. The third shot had an arrow that hit and stuck into Guan Yu's helmet. The gong rang and Huang Zhong's master at the time, furious at the intentional misfire, ordered him executed. Huang Zhong was saved through Wei Yan revolting, and, the both turned to Liu Bei in time. Huang Zhong continued to use his archery skills throughout the campaigns of his master until his death.